Ø Not legitimate: These declarations are not legitimate because one political party doesn’t have authority to declare as such. In other words, UCPNM doesn’t have authority to restructure Nepal in this fashion. Ø Not democratic: These declarations, by UCPNM, a party with about 40% seats in CA, do not constitute a democratic move. Besides, all other political parties too can go around declaring various provinces of their own as such and will still be undemocratic. Unless two-third CA members formally resolve to declare as such, the declarations will not be a democratic exercise. Ø Unconstitutional: Clause (3) of article 138 of Interim Constitution has expressly stipulated that the final decision relating to state restructuring shall be made by the Constituent Assembly. In this backdrop ex parte declaration of various provinces by UCPNM is being done in contravention of the Interim Constitution. Ø No due process: The process to restructure is for the CA to finish writing the constitution and, thereafter, promulgate it, in doing which a decision will be reached as to how Nepal is to be restructured. As CA has yet to reach a decision in this respect, the declaration fails to conform to the process envisaged by the Interim Constitution. Let’s take the case of declaration of Newa Autonomous State, to be made today. 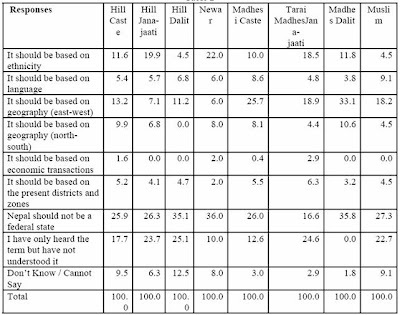 According to Table 2 below – result of the same study referred to above, only 22 percent of Newa people are in favor of this and 36 percent opine that “Nepal should not be a federal state”. From this it is clear that people in Nepal aren’t in favor of this type of state restructuring. A consensus needs to be reached as to whether Nepal needs to be restructured and how best to do so in the best interest of the country and people and only then a move should be made towards this. Ø Not genuine declaration: UCPNM has acceded publicly that the declaration is just “publicity”. Based on this confession on the part of UCPNM, some have even called it “publicity stunt” or a political “farce.” UCPNM should be careful in taking such actions.